Verizon Treo 650 Bluetooth Disabled? Thanks to a member of the everythingtreo forums, we have confirmation that Verizon will be releasing the Treo 650 in the coming weeks. One of our members visited a local Verizon dealer who was kind enough to share placards for the upcoming Verizon Treo 650. 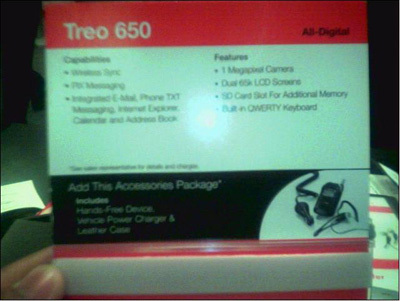 Our forum member was able to take a picture of the placard that shows the features of the new Verizon Treo. This timing would make sense as the Verizon Treo 600 price was recently reduced. Oddly enough, the placard does not advertise the Bluetooth capabilities. This is pure speculation at this point, but one has to wonder. UPDATE:According to a Verizon Wireless ad, we have confirmed the new Treo will include Bluetooth. Discuss the Verizon Treo 650 release in our forums. To be notified when the Verizon Treo 650 is officially released, please sign up for our newsletter.